A white spot on nail is very common, everyone at some point in their lives experience them. These spots can indicate a few different things, because the different patterns of white spots may be symptomatic of different causative conditions, but the underlying theme is that your body is trying to tell you that you are not healthy. It's essential to know the causes and take respective measures to treat them. Due to the fact that these spots take some time to appear after the injury, you may have forgotten all about the injury. Some examples of the types of injuries that can cause these spots are banging the finger on the door or banging it on the countertop or with a hammer. Having manicures done frequently can cause injuries to the nails as well. There are times when white spots can appear on the nails due to an allergic reaction to nail polish, nail hardener or even nail polish remover. Application of acrylic nails on your fingers can cause trauma to the nail base. Zinc is a metal that is normally found in the human body. 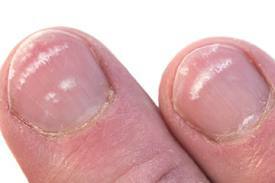 A zinc deficiency in a person commonly causes white spots or streaks in their nails. A change in the person's diet can help to resolve this problem. Some foods that can help to add zinc to the person's diet are oysters, baked beans, yogurt, crab, beef shanks, pork shoulder, spinach, nuts and whole grains. A protein deficiency in a person will show as horizontal bands that extend across the nail bed. These lines are known as Muehrcke's lines. Due to the fact that these lines are on the nail bed and not on the nail plate, they will not simply grow out with your nails. When the protein levels return to normal, these lines will usually just disappear. There are some rare cases in which these lines can be indicative of liver disease. There is a way to test to see if these lines are Muehrcke's lines or not. Just press down on the nail plate, and if the lines disappear then they are Muehrcke's lines. Recommendations of protein-rich foods: Turkey beast, fish (salmon, tuna), pork loin, lean beef, tofu, beans, yogurt, soymilk, nuts and seeds. Possibly because of the numerous calcium enriched nail strengtheners on the market, there is a widespread belief that calcium deficiency causes leukonychia. White spots on nails can be caused by this mineral deficiency indeed. In order to treat calcium deficiency, you can simply add calcium to your diet, drinking orange juice or any other calcium fortified food or drinks will help. A subtype of an infection that commonly appears on the toenails is known as white superficial onychomycosis. Fungi are the cause of these white spots and they appear on the nail plate and then they spread to the nail bed. This disorder presents with the toenails appearing flaky at first and then the nail becomes thick. Nail splitting then occurs and there is significant pain while wearing shoes. There are some other disorders that can mimic this disorder, so in order to diagnosis this form of onychomycosis, a doctor can clip a piece of the toenail and examine it under a microscope or they may choose to place the clipping into a special container and watch it over time to see what type of fungus grows on it. An oral anti-fungal medication in combination with a topical ointment is normally recommended. This will usually clear this condition up within three months, although it is important to be aware of the fact that the topical ointment generally will not fully penetrate the nail plate to reach the nail bed. There are some serious diseases that present symptoms like white spots on the nails. Therefore, it is extremely important to see a doctor if you notice any discolorations in your nails. The earlier you see the doctor the more likely it is to treat the condition effectively. Liver disease, like hepatitis and cirrhosis, is one of the more serious causes of white spotted fingernails. Kidney disease also has symptoms that affect the nails, such as nails that are possibly white and pink. The nails can be turned partially white due to kidney failure. Anemia, which is also a sign of iron deficiency, can produce pale or white nail beds. Adding iron to the diet, such as leafy greens and meats, and avoiding dairy, will help to reverse the iron deficiency. There are some cases in which the person may develop koilonychias, which is abnormally shaped thin fingernails with raised ridges that curve inward. In order to hide these white spots, you can use nail polish, preferably a light shade of pink or peach. Maintaining a good level of moisture in the hands is important. A good tip for this, is massaging the hands and fingernails with either vitamin E or hand lotion, which can be applied to the skin on the side of the nails as well. Patience is of the utmost importance when letting the white spots on the nails grow out. With time they will grow over the smile line, which is the separation between the bed of the nail and the actual growth of the nail. Once this occurs, you can clip, cut or file them down, but it is extremely important that you don't take off too much, it is necessary to leave some actual growth so you do not damage the nail bed. Maintaining a balanced diet is essential for the overall health of the entire body, including the fingernails. Consuming foods and drinks that are fortified with calcium is a good way to keep the nails from getting these white spots. These white spots tend to appear if you are not getting enough vitamin C in your body. Therefore, it is important to eat foods and drinks that contain vitamin C, such as oranges, grapefruits and orange juice. White spots on nails can be a signal that you are lacking zinc, sulphur and iron. Include more foods which contains these elements can help you treat the condition. At the same time, you can always take moderate amount of supplements.